News of another price drop from Dbeere Yachts as Jon Ford announces a €405,000 cut on the 24.4m motor yacht Noah White. A one-owner yacht, Noah White is a Sunseeker 80 dating from 2010, and she accommodates eight guests in an Italian-influenced interior. 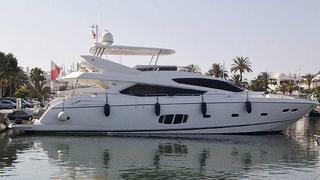 Twin MTU V12 2000 M93 engines give her a cruising speed of 24 knots. Lying in Mallorca, Noah White is down from €2.9 million to €2,495,000.